Eggs, cholesterol and CVD—Here we go again! A recent publication in the Journal of the American Medical Association* has resurrected concern over elevated dietary intake of cholesterol and cardiovascular disease (CVD). 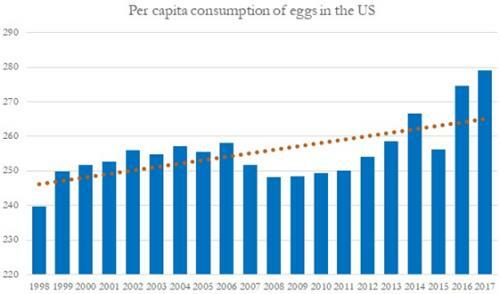 In recent years, expressing the words of Dr. Robert Eckel, Editor of JAVMA "the association of egg consumption and dietary cholesterol with CVD, although debated for decades, has been thought to be less important." The article by Zhong and colleagues affiliated with the Northwestern University, Feinberg School of Medicine associates elevated cholesterol intake and hence eggs with a higher incidence of CVD in an analysis based on 29,615 subjects from six prospective studies followed for 17.5 years. The population comprised 45 percent men and included 31 percent blacks. Cardiovascular outcomes included stroke, fatal and non-fatal myocardial infarctions and heart failure. All-cause mortality was compared to CV events. The study adjusted for potentially confounding demographic, socioeconomic and behavioral factors including smoking. The study concluded that each additional daily 300mg/day intake of cholesterol (say 1.8 large eggs) was associated with a significantly elevated risk (at the 95 percent level of confidence level) of incident CVD, assigning a calculated Hazard Ratio of 1.17. Consumption of one egg every two days was associated with a significantly elevated risk of CVD outcomes with a Hazard Ratio of 1.06. The association between egg consumption and incident CVD was not significant after adjusting for dietary cholesterol consumption. The authors suggested that the results of their study, associating eggs in the incidence rate of CVD, should be considered in developing dietary guidelines. Although implicating egg consumption the observational study was not able to distinguish between the statistically derived association and actual causation. It is apparent that in succeeding weeks the Egg Nutrition Center and their consultants in epidemiology will have to evaluate the peer-reviewed article. Dr. Mickey Rubin, quoted in the The Wall Street Journal of March 16th said "this study is inconsistent with multiple recent studies showing no association between eggs and heart disease risk". He will have his work cut out to refute the findings and to promote the nutritional benefits of eggs. Given the accumulation of scientific evidence contrary to the conclusions of the study there should not be any adverse effect on consumption that has recorded only incremental expansion over the past four years. The danger is that activists opposed to intensive livestock production including vegans, environmentalists and proponents of animal rights will distort and amplify the findings using social media. If we did not have the AEB and the ENC these entities would have had to be invented. Since we are fortunate to benefit from their resources they are worthy of industry support. *Zhong,V. W. et al. Associations of Dietary Cholesterol or Egg Consumption With Incident Cardiovascular Disease and Mortality. JAMA. 321:1081-1095 (2019).